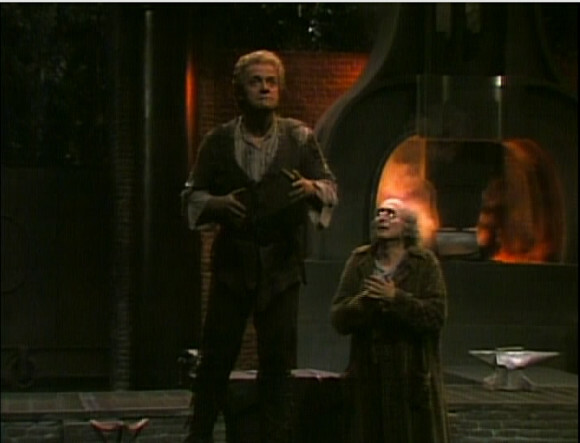 There may be better video recordings of Tristan und Isolde than Daniel Barenboim and Heiner Müller’s 1995 Bayreuth collaboration but I haven’t seen one. It combines a deeply satisfying production, outstanding conducting and brilliant performances from the principals; Siegfried Jerusalem and Waltraud Meier. The only downside, and it’s not serious, is that, as a 1995 recording, it’s a bit short of the latest and greatest in audio and video quality. And so, at last to Götterdämmerung. 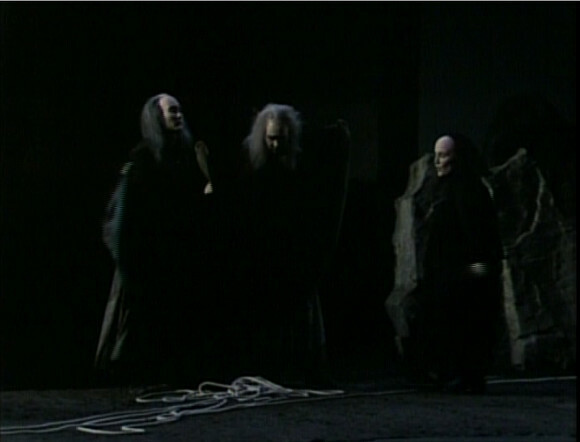 The scene with the Norns is dark, very dark. There’s a rope and not much goes on (at least that is visible) but the singing is good. The “dawn” scene comes off more effectively here than the final scene of Siegfried but it’s still not great. I think the problem is a combination of Manfred Jung’s dry, rather nasal tone and Boulez rather fast tempu. It seems rushed rather than ecstatic and the Rhine Journey doesn’t thrill. I was concerned at this point that I was being unfair to a renowned production so I put on the same scene from Kupfer/Barenboim. It’s much better. Siegfried Jerusalem sounds truly heroic, Anne Evans richer tone blends better than Gwyneth Jones’ (though this could be an artefact of the recording) and, crucially, Barenboim gives the singers room to sing before markedly speeding up for the orchestral music. At least there is no naff attempt to depict a literal Grane in Chéreau’s version. At the conclusion of this scene Brian Large pulls off the first of his artsy effects. During the Rhine music he holds a close up of Brünnhilde for a rather long time before pulling out to a full stage shot which he then shrinks until there is just a tiny square of picture in the middle of a black screen which, when he slowly expands it, has transformed to the Gibichung hall. He does the same thing a couple more times. It seems odd to introduce that kind of thing at such a late stage in the cycle. 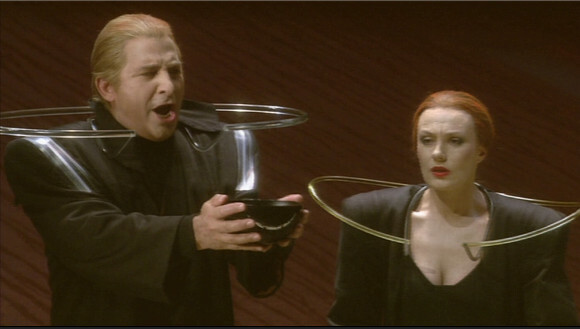 Chéreau’s Siegfried is even less obviously “industrial” than his Die Walküre. There’s a forge of course but there rather has to be. Other than that we get workshop, forest and lair pretty much as one might imagine until, of course, we end up back at the ruin where Brünnhilde waits. Brian Large injects lots of smoke at every opportunity. 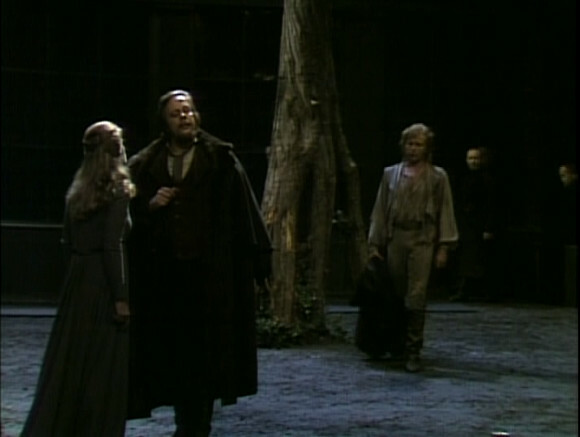 The second instalment of Patrice Chéreau’s 1980 Bayreuth Ring cycle is set, like Das Rheingold, in a sort of industrial bourgeois late 19th century. One would almost say steampunk if that were not an anachronism. Actually the “industrial” side is much less evident than in the earlier work. There’s a sort of astrolabe/pendulum thing in Valhalla but that’s about it. Setting aside, the story telling is very straightforward; so much so that it takes a real effort of the imagination to get into a mindset where this production could ever have been considered controversial. It’s quite literal; Brünnhilde has a helmet and breast and back plates (worn over a rather severe grey dress), Wotan has a spear, Siegmund has a sword. There’s not an assault rifle or light sabre to be seen. It is though dramatically effective. So much has been written about Patrice Chéreau’s centenary production of the Ring cycle at Bayreuth that I approached reviewing it with some trepidation. I have decided to write about it “as is”; i.e. to write about what I see on the DVD and leave the undoubted historical significance, perhaps even revolutionary impact of the production, to others. Also, it’s apparent that what’s on the DVD, filmed in an empty house as was contemporary Bayreuth practice, must differ from what was seen on the Green Hill in certain key ways. This is a review of what;s seen and heard on the DVD.